Incredibly hydrating, soothing and with a scent that smells like a holiday in the South Pacific our tropical body treatment will leave you with glowing, silky and nourished skin in an instant. Made with tropical oils, superfood oils and ‘the flower of flowers’ ylang ylang, it’s lightweight, quick to sink-in and infuses skin with an intense moisture boost. Its transformative benefits become evident from the first use ; dry patches vanish, skin has a radiant glow and becomes incredibly soft and supple. The blend of tropical oils is packed with vitamins, antioxidants, fatty acids and plant collagen. Coconut oil soothes and conditions the skin. Camellia seed oil targets stretch marks and helps increase skin elasticity. Sweet almond oil fights the signs of ageing. Baobab oil and Moringa oil stimulate the production of collagen and elastin and Ylang Ylang calms your mind and lets you dream of faraway shores. Massage evenly onto skin, concentrating on dry and problem areas. You can use The Body Treatment on dry or damp skin. We suggest you use the body treatment at least once or twice a week for best results. In fact, we’re that convinced that you’ll love Lani, we’re sure you’ll want to use her every day. 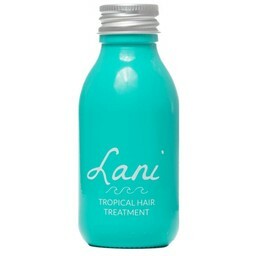 Lani Tropical Body Treatment is not a tanning oil but is perfectly safe for use in the sun. We always recommend the usage of SPF when sunbathing.